Remember The 3G Project articles? Shortly before it got serious I discovered there was a TV/Radio tower about 3.5 miles to my south that a start-up leased space on to offer WiFi service. The tower’s in the town of Schulter, and the guy that runs it said I was way out of the subscribing area. His setup is plain vanilla 2.4 Ghz WiFi delivered by some Cisco Aironets running in 802.11b mode, but they’re backhauled to several 5.2 MB DSL lines just two hops away. With the advent of this discovery, the 9.5 mile attempt to reel in AT&T 3G service was scrapped, and I turned my attention to what appeared to be a more attainable goal. The challenge: Engineer my own link to a WiFi access point in the town of Schulter, 3.5 miles to my south. First, I assessed the conditions. Long distance WiFi is still young in practice, but one thing it depends on for success is clear line-of-site, which quite simply means you can see (or would be able to see, if your eyes were bionic) the antenna at the other end, and the transmission path is clear of obstructions between the two sites. My conditions were what is known as Near Line of Site, meaning there are obstructions in the path, but not a complete blockage. My house and it’s surrounding acreage are surrounded by trees, very mature at 30 feet + in height. Officially, I am way out of the subscriber area for the Schulter service, but the owner promised to let me on if I could engineer my own link. He chuckled at the thought that this would be successful. But I was persistent, and we had several email exchanges where I asked for information that would help me to be successful. After these rounds of emails completed, I believe he began to take me more serious. After all, it’s not every day that someone emails you asking what polarization your antenna farm is using, so he figured I at least had some kind of plan, and he became much more cooperative from that point on. The only positive thing about my location was that I could sometimes see a blinking strobe light from the Schulter Tower, only at night, and if I stood in just the right place on my roof to see it in between whatever trees and brush were blocking it from here to there. 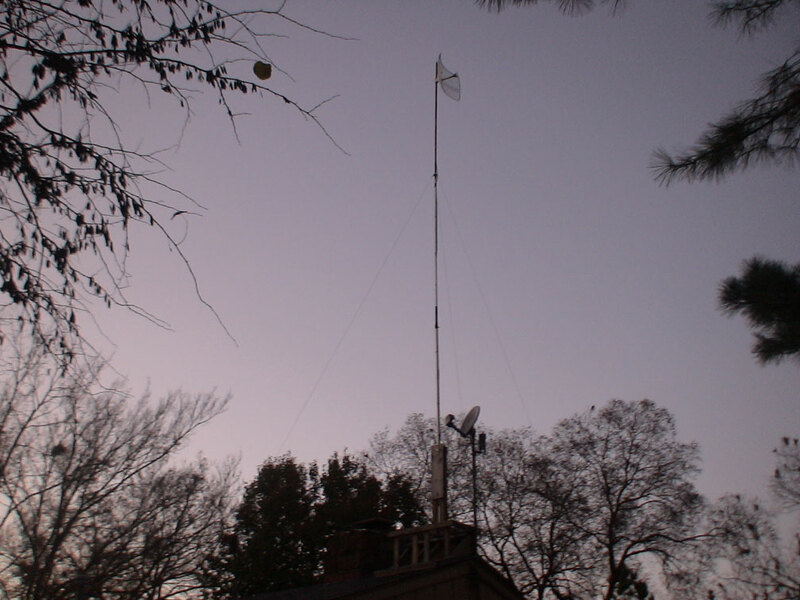 After surveying my property, I figured I’d need a high gain directional antenna grid at a height of at least 45 – 48 feet to clear any trees in between me and the tower (which fortunately sits on a hill, meaning it’s a taller target which was also in my favor) – 2.4Ghz is a small wavelength, which means that the signal will bounce off of everything, including trees and leaves (especially when they are lush green and wet). 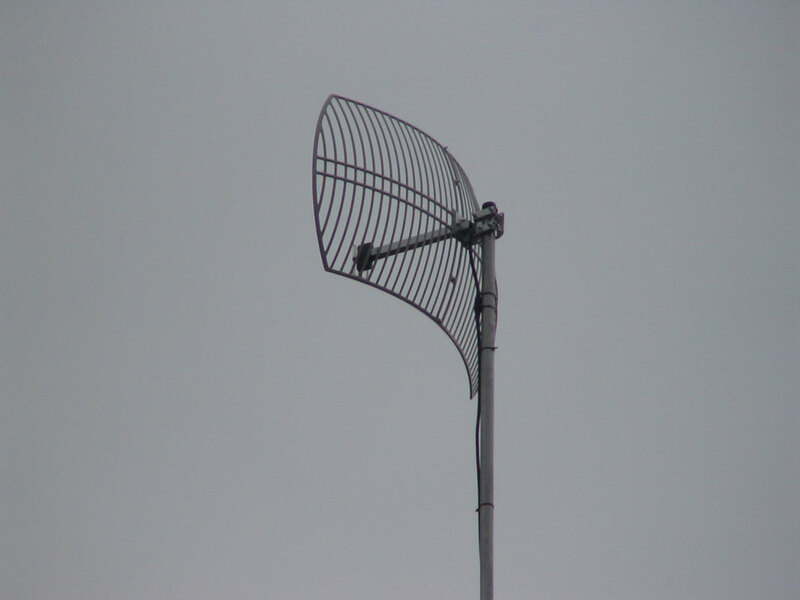 A highly directional antenna would make it much harder for me to acquire the Access Point (AP) on the tower, but because they greatly narrow the signal beamwidth they operate much more efficiently and can result in a usable signal at longer distances. 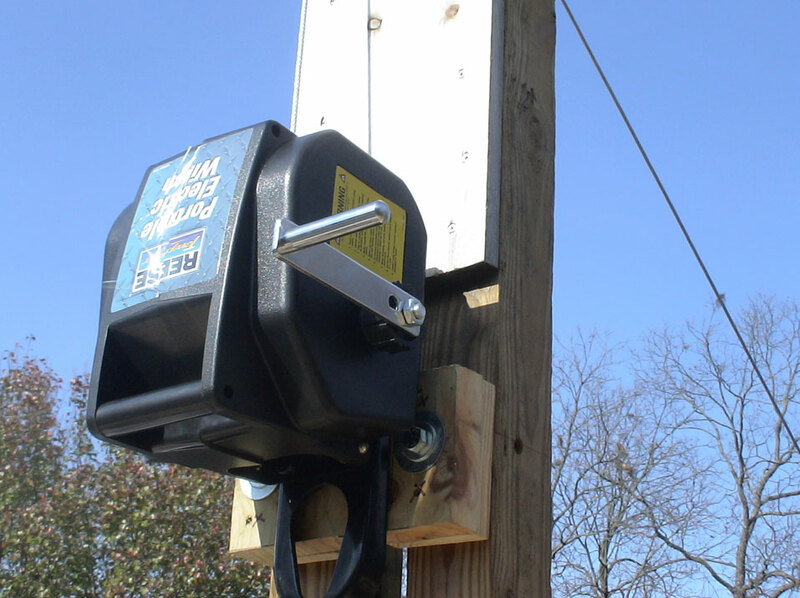 I decided to keep the base mount I built for the 3G project that straddles the highest point of my roof without doing any damage to the roof (no holes, drilling, etc…)…this would let me “cheat” by starting my antenna mast at the roof height. It (the ridge mount base) looks like another roof peak straddling the existing peak for stability, and I’ll hopefully cover it with tar paper and shingles whenever the weather decides to cooperate. As of this writing, we’re expecting 4 to 8 inches of snow here in the next day or two. Sigh. But I digress. There are two weatherproof 4 x 4 x8 posts rising up out of the center of this fake peak with a hinge at the bottom constructed out of grade 8 bolts that serve as a sort of poor man’s hinge to let me raise and lower the mast…picture a flagpole mounted on a pivot in such a manner that you could tip it over and lay it flat on the ground anytime you wanted. That’s essentially what I made for the antenna mast. 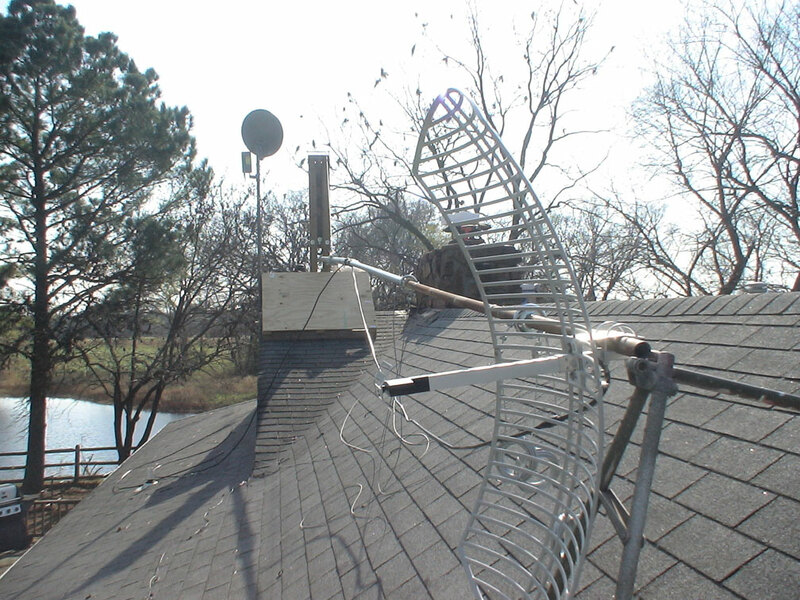 The right antenna for this job is a parabolic grid antenna tuned for 2.4Ghz. It is is very directional…and it’s one of the main ingredients to getting this project to succeed. The model I bought has a beamwidth of about 8 degrees. At 3.5 miles that means a movement of just a couple inches left, right, up, or down can make or break the link altogether. Imagine playing darts with the dart board positioned 500 feet away. That’s a rough analogy of the target we’re trying to hit at the other end. The narrow beamwidth has the effect of concentrating all the signal in a very focused stream – it’s essentially a trade off. We can only receive and transmit in one direction, but the efficiency goes way up, and the effect is like sending and receiving with more power than you actually have. Here’s a shot of the grid, from behind. It may look tiny in the picture, but it’s roughly 4 feet across. Another other important consideration was transmit power and receive efficiency of the WiFi adaptor at my end of the link. I literally spent weeks researching the ideal WiFi adaptor for the project. I knew I wanted it to be USB based so that I could easily mount and connect it. Receive sensitivity, which is a measurement of how well an adaptor can “hear” a signal at a long distance, was a crucial factor. The unit I bought claimed to be able to hold together a 1 MB link with a signal level of -96 dbm. That is a very quiet signal. It was also spec’d to hold an 11 MB link (that’s the performance I wanted) at -92 dbm. For comparison, most consumer grade adaptors wouldn’t even see an AP with a -92 dbm signal. It was also important to me that the adaptor have some serious transmit power…most consumer grade gear transmits between 80 and 100 mw, and at my distance to the AP, that wasn’t going to cut it. 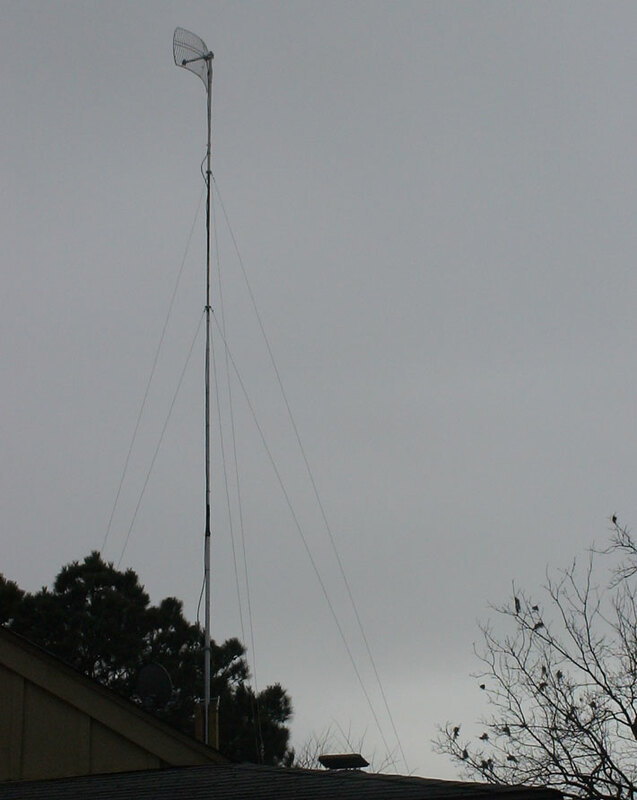 The unit I bought claimed to transmit at 1000 mw (1 full watt), although several independant tests I read said it was closer to 600 mw. That’s still a lot of transmit power, and when mated to the grid, it would certainly help me shoot the long link back to the target. The right adaptor turned out to be an Alfa AWUS036H. Wow, I hope this thing stays up there. I’ve got to tell you, after all the work I’d put in so far I was really starting to worry about whether it was going to work or not. There’s no guarantees with something like this. My hands were literally shaking when I hooked up my Alfa radio and went looking for signal. 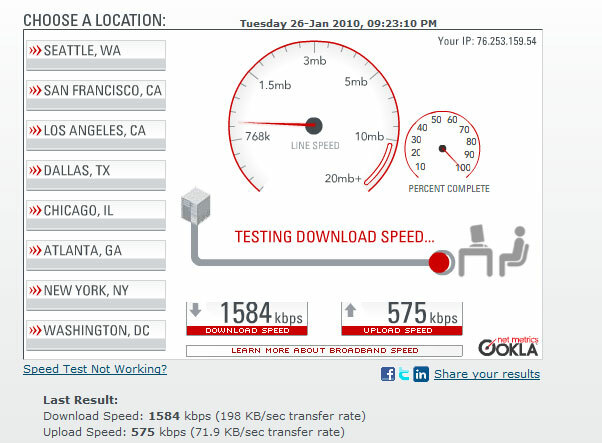 This link tests good to about 1.5 mb, just slightly more bandwidth than a T-1, and that’s about an average amount of bandwidth for the Schulter subscribers, I’m told. The guy who owns the tower is charging me $33 a month to connect. His backhauls are multiple 5.2 mb DSL lines direct to AT&T, and the the last hop to those lines is carried over a wireless G (54mb) bridged link from another city to my north. My average ping times to the Internet in general are between 15 to 25 ms. Gamers would so die for that kind of latency. That is a very ambitious, and evidently successful, effort. Congrats!